Where Is It Best To Have Your Breast Implants? Breast implants are pretty much an easy option for girls these days to look better. Every girl wishes to have a great personality and looking fuller at the right places is very important to achieve that. Although having breast implants done is very common these days however you cannot ignore the confusion that comes along with it. The confusion is- whether the implant should be placed below the muscle or above the muscle. The pectoralis major muscle is basically a large fan shaped muscle. It does not cover the lower outer aspect of the chest wall. Surgeons usually detach the muscle from its lower origin along the ribs when the implant is placed under it. In this case just about half the implant will be covered by the muscle. Meanwhile the pectoralis minor muscle is a smaller muscle that lies under the outer edge of the pectoralis major. The serratus muscle is found on the sides of your chest wall. The sensory nerve that goes to your breast comes in between the nerves of your breast between the slips of this muscle in order to enter the back of your breast tissue and then it moves to the rest of the breast. The surgeons mostly opt to place the implant on top of the pectoralis minor and serratus muscles-below the pectoralis major muscle. There are basically two options while going for breasts implant. The breast implant can be done in two ways and each option has its pros and cons. Here the implant is placed under the muscle and directly over the rib cage. The implant is however just partially covered, thanks to the structure of the muscle. The recovery time of this placement is longer as during the surgery, the surgeon has to manipulate the muscle. Due to increased swelling which happens due to muscle interference, the implants end up taking more time to come back to its natural position post-surgery. With this placement, there is also certain degree of lateral displacement. The implants sit in less than a natural position due to this. Makes mammograms easier to read, which is essential for a women who has a history of breast cancer. The muscle acts as a divider that maintains the placement of the implant towards the rib cage and away from the breast tissue which needs to be seen on the mammogram. 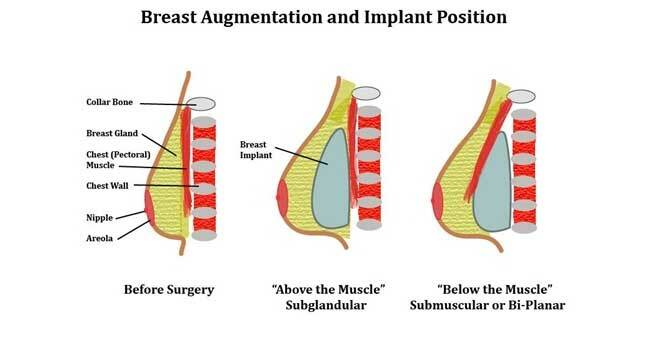 The placement of Breast Implant in Sub glandular position is placing the implant behind the mammary gland and in front of the muscle. This placement stops the chest muscle from interfering with the look or the integrity of the implant. After the operation, sub glandular placement is quick to recover as it grants less pain as well as discomfort for the patient. This is because only fat and skin was disturbed and not the muscle. Patients will be able to recover quickly too. This placement is not recommended for women who have large breasts as there is a risk of visibility of the top edge of the implant.